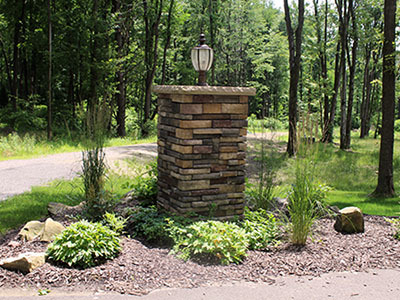 Blooming Valley Landscape & Supply can make your home or business look amazing at night! 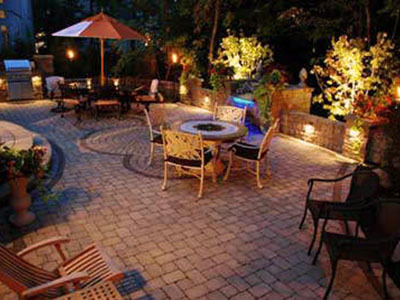 We highly recommend landscape lighting to all new landscape installations. The art of landscape lighting adds creative and intentional accents during the low lit and night time hours and adds another unmistakably beautiful dimension to your home or business landscaping. Casting shadows on your home, lighting up your business’s sign, spotlighting specific plants and trees, elegantly lighting up your walkway, accenting your new retaining wall, creating reflections in your pond, giving true depth to the scene; it will all just amaze you! If you can’t make up your mind of whether or not to spend the extra dollars on lighting, let us take you to a home or business we’ve lit up so you can see for yourself.